Did you know you can ride a bike down Whiteface? Did you know you can ride a bike down Whiteface Mountain? Two thousand four hundred and fifty six vertical feet. That’s almost a half mile. And I rode it. On a mountain bike. It was crazy. It was scary. Author’s Note: Crazy and scary not your style? Scroll down to the bottom and learn how you can still have the time of your life at the Whiteface Bike Park! The Whiteface Region has long boasted about having the most and best: The Whiteface Ski Resort has the most vertical feet east of the Mississippi; the Little Super Sandwich has the best quality-to-size-to-cost ratio in the the world. The Summit Quad lift deposits skiers and boarders at an elevation of 4,386 feet above sea level. If you slide all the way down to the Base Lodge, you’ll lose 3,166 feet of elevation. 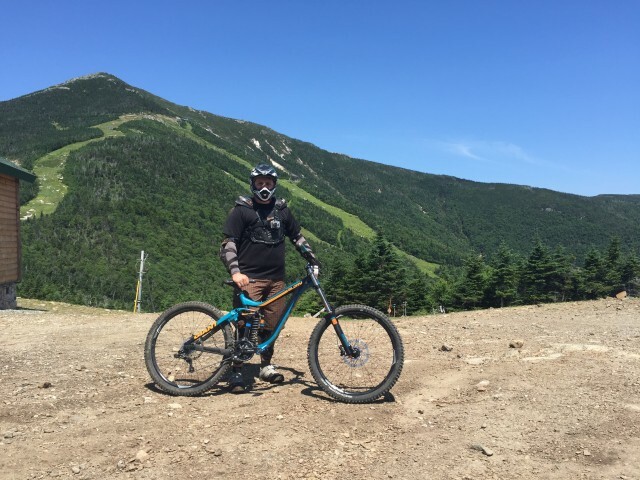 There are no bike trails from the Summit Quad, so if you’re looking to ride a bike down, you’ll have to settle for a gondola ride to the top Little Whiteface, a shoulder peak that rises to a mere 3,676 feet. For those of you who aren’t some sort of Rainman-esque math genius, that’s 2,456 vertical feet. And suited up is right. I was quickly outfitted with a full-face helmet, chest/shoulder/back armor, elbow/forearm pads, and knee/shin pads. Next up, Mike helped me pick out a steed for the day, a Giant Glory. Downhill bikes are built for two things: going downhill very fast, and having fun. As per Mike’s suggestion, I started with a mid-mountain shuttle run, just to warm up and get used to riding the larger bike. On the way up, I met a fellow rider named Holly. She had been to Whiteface several times before but wasn’t “a speed-crazed psycho.” (Or something to that effect.) We decided it was a good idea to ride together so the other could call for help or at least chronicle the fantastic blaze of glory we went down in. At the shuttle stop we got our bikes down and picked Trail #12, called “Opiate.” I’m not sure about narcotics, but this trail was a lot of fun and the Giant Glory was a speed machine. Within a few pedal strokes, I was ripping through the woods, leaning into the corners, and flying over rocks and roots. With each turn my confidence in the bike grew. So with each turn I found myself using the brakes less and pushing the limit just a little bit more. When you push the limits, you inevitably find them. So after hopping a small drop in the trail, I found myself sailing over the front of my bike. I tumbled for a bit, heels over head, with the bike landing on top of me. Now, at this point, my more timid readers may be thinking that this is just too crazy. But let me assure you that when I stood up, I was mostly unscathed! In fact, other than a few scrapes, I was completely unharmed. I highly recommend getting every piece of protective gear they offer there at Whiteface. All that protection did its job and I was able to keep riding. That was a good thing, because the real adventure was still to come. After collecting myself at the Base Lodge, Holly and I decided that we didn’t get all dressed up for nothing. So we headed over to the gondola to try our luck from the top. Author’s Note: You can ride the gondola up to the top of Little Whiteface without a bike. In fact, it’s a nice way to get to one of the best views in the Adirondacks. It bears mentioning here that the gondola only accesses the black diamond trails. A downhill bike is a must and full-face helmet and pads are highly recommended. Holly lead the way down Trail #27, called “Evil Empire” (Skiers will recognize this trail as “Approach”). The top of this trail provided some of the best views of the day. It was almost impossible to keep my attention on the trail. I say “almost” because these trails demand your attention! A short while down Evil Empire we took a sharp left onto Trail #26, called “Cliffs of Insanity.” Yes, that’s right. I voluntarily went down a trail called “Cliffs of Insanity.” And it did not disappoint. After riding and walking (more walking than riding for me) down the rest of Cliffs of Insanity, we reconnected with Evil Empire and continued dropping down, down, down, until we reached Mid Station. Unfortunately, the bar was not open. So we decided to take Trail #4, “The Fire Swamp,” over to Trail #5, “The Judge,” instead. While drinks were not flowing, The Judge has a creek crossing complete with waterfalls upstream and downstream and a small pool in the middle. The cold mountain water was better than any beverage, especially when we soaked our battered legs in the pool. Very refreshing! Think of it as an Adirondack-style spa. After The Judge, we made our way down through the trail on the lower mountain. Even though the gondola did all the work to get us to the top, downhill mountain biking is still a workout. I know what some of you are saying, “But Daniel, that seems too extreme for me.” Well, you’re in luck. Whiteface Bike Park is like a “Choose Your Own Adventure" book. If you want to race the gnar, you can do that. If you want to see the gnar, and walk down a mountain with a bike (like me), you can do that. If you only want to take the shuttle and stick to the lower mountain trails, you can do that! But what about the kids?! Here’s a secret for those of you who’d like a milder adventure or have smaller kids in tow. Your ticket to ride the shuttle also gets you on the gondola, so you can rent cross-country bikes and ride the flatter trails, take a lunch up to the top of Little Whiteface, then come back down and ride some more! You can also get a pass to the Whiteface Adventure Zone in case the kids have any energy left. However you want to take it, Whiteface Bike Park is a fun ride! Enjoy this heavily edited video of the day's adventure! 10 fun facts - #9 is pretty psychedelic! 4 funky facts you may not know! 50 degrees and dropping… what lies below? 9 bits of trivia you'll never guess! 8 random facts & ninja turtles?